Employees get used to doing something a certain way and sticking to it, and billing departments are no different. The problem comes when billing staff stays the same while new regulations are enacted and the policies of payers shift dramatically. Trends, such as the number of denials and time in A/R increasing, should be evaluated regularly so that adjustments can be made. Billing departments should be given freedom and encouragement to develop new ways to improve cash flow when faced with difficult obstacles, even if that means outsourcing some billing to a outside agency. In order to tackle these kinds of problems, billing departments need an effective revenue cycle management strategy. Part of that strategy should empower staff to carefully analyze denied claims to see where the biggest problems lie. For many providers, solving a few key issues can improve revenue dramatically. Thousands of new ICD-10 codes have been implemented during the past few years, and it can be very difficult for healthcare staff to keep up with all the changes. If healthcare employees aren't being trained on the new coding standards, billing departments will be severely hindered in collecting claims from payers. One of the most effective ways to keep employees up to date is to hire a compliance expert who can provide ongoing training while doctors and nurses keep most of their focus on patient care. Whenever changes are made to the law, an expert will help everyone stay up to speed. Doctors, nurses, assistants, and other healthcare staff work hard every shift, leaving little time for developing new billing procedures or learning new regulations. For this reason, many providers have decided to outsource a lot of their billing responsibilities to third-party services. Sometimes the roadblocks facing a billing department are too onerous to clear, and taking a different road is the best choice. Of course, your staff needs to handle some aspects of billing, but the outside company will be there to provide assistance whenever necessary. According to the Medical Group Management Association, it costs healthcare providers $25 on average to rework a denied claim. For providers that are still submitting claims manually, the cost may be even higher. 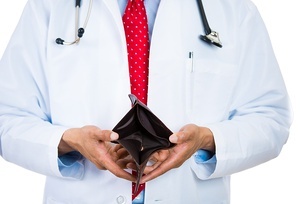 When denials management expenses are too high, providers should consider updating some of their processes to take advantage of modern technology, especially automation. The more things are done manually, the more likely mistakes are going to be made. The first step to improving the revenue cycle is to recognize when these types of problems are present. Once a diagnosis is made, there are a wide range of tools and services available to increase the amount of revenue. Most problems come down to lack of knowledge and resources, making outsourcing an ideal solution for many providers. By entrusting experts with some crucial billing responsibilities, staff can focus on providing the best possible care for patients. For help with your denials management, contact us today.